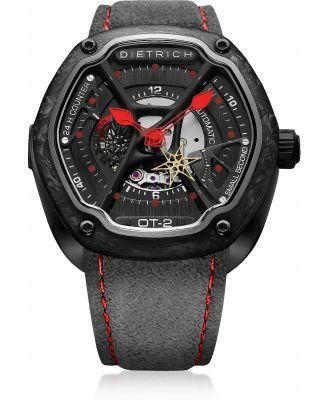 OT-1 316L Steel Men's Watch w/Red Luminova and Suede Strap, is a bold and powerful timepiece that strikes a balance between pleasure and form. Featuring 46mm 316L steel frame and bezel blasted and polished, open view on the escapement 4 layered dial; first and third layers sun brushed black, second and fourth layers vertical brushed black, bright red night luminescent hands and numeral and dot indexes and custom shape sapphire glass. Dark grey Nubuck strap with bright red stitching and grey PVD buckle. Automatic mechanical movement Miyota 82-S-7. Water resistant up to 50 meters/5 ATM.